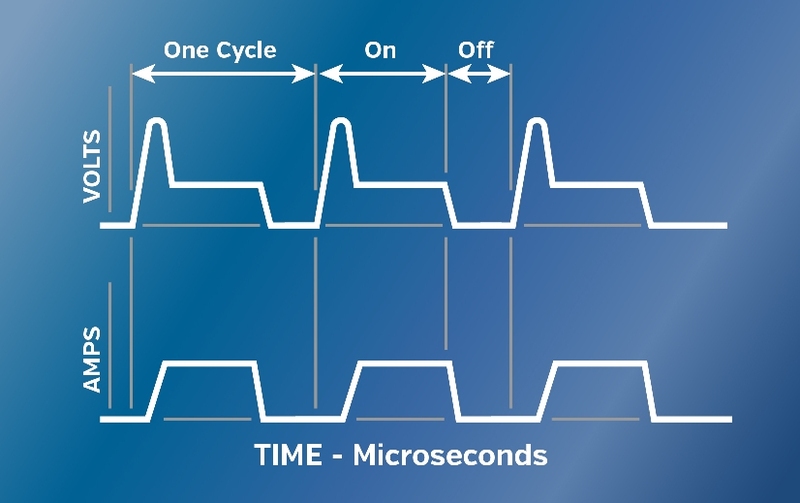 Each cycle has an on-time and an off-time that are expressed in units of microseconds (figure 3-1). Since all the work is done during on-time, the duration of these pulses and the number of cycles per second (frequency) are important. Figure 3-1. Each cycle has an on-time and off-time. Metal removal is directly proportional to the amount of energy applied during the on-time. This energy is controlled by the peak amperage and the length of the on-time. The longer the on-time pulse is sustained the more workpiece material will be melted away. The resulting crater will be broader and deeper than a crater produced by a shorter on-time. These large craters will create a rougher surface finish. Extended on-times also allow more heat to sink into the workpiece and spread, which means the recast layer will be larger and the heat affected zone will be deeper. Excessive on-times can be counter productive. 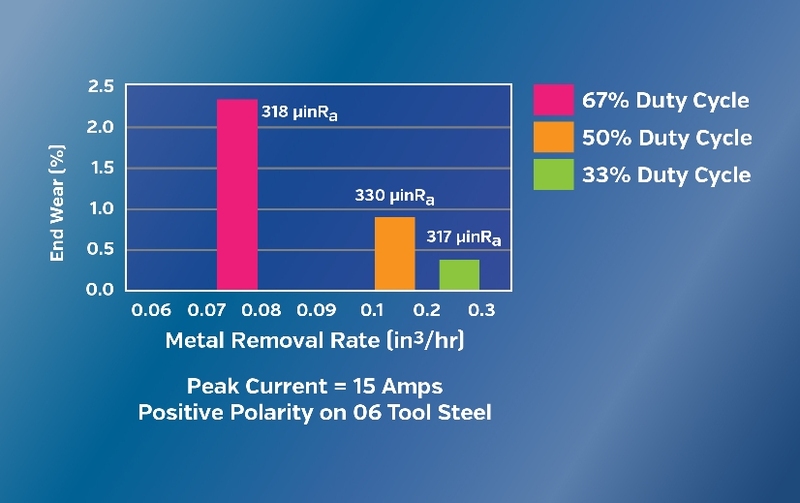 When the optimum on-time for each electrode material/workmetal combination is exceeded, the Metal Removal Rate (MRR) actually starts to decrease. Electrode — A long on-time can put the electrode into a no-wear situation. Once that point is reached, increasing the on-time causes the electrode to grow from plating buildup. Workmetal — One theory is that the metal melts to the maximum depth and at that point the heat spreads outward without melting more metal and without sustaining the melting temperature at the bottom of the crater. The cycle is completed when sufficient off-time is allowed before the start of the next cycle. Off-time will affect the speed and the stability of the cut. In theory, the shorter the off-time the faster the machining operation will be; however, if the off-time is too short, the ejected work piece material will not be swept away by the flow of dielectric and the fluid will not be deionized. This will cause the next spark to be unstable. Unstable conditions cause erratic cycling and retraction of the advancing servo. This slows down cutting more than long, stable off-times. Spark energy is the combination of amperage, voltage and on-time. 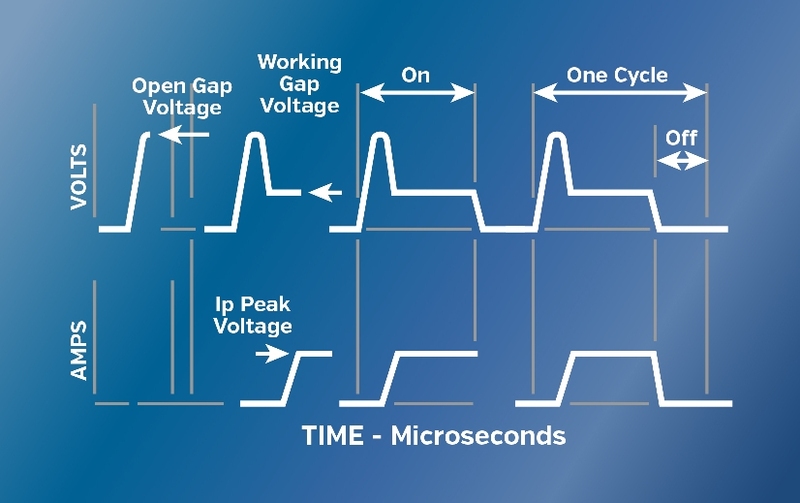 Amperage — During each on-time pulse, the current increases until it reaches a preset level, which is expressed as the peak current (figure 3-2). Figure 3-2. Once the open gap voltage creates an ionization path for current flow, the voltage decreases to the working gap voltage. 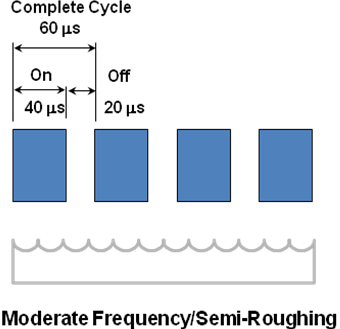 Current increases until it reaches peak current during the effective on-time portion of the cycle. Voltage — Before current can flow, the open gap voltage increases until it has created an ionization path through the dielectric (figure 3-2). Once the current starts to flow the voltage drops until it stabilizes at the working gap level. The preset voltage determines the width of the spark gap between the leading edge of the electrode and workpiece. High voltage settings increase the gap, which improves the flushing conditions and helps to stabilize the cut. However, when using graphite electrodes, high open gap voltage will increase electrode wear. Polarity refers to an electrical condition determining the direction of the current flow relative to the electrode. The polarity of the electrode can be either positive or negative. Depending on the application, some electrode/workmetal combinations give better results when the polarity is changed. Generally with graphite, a positive electrode gives better wear and a negative electrode gives better speed. The Guide to Electrode Polarity Chart in Chapter 8 shows some workmetal exceptions (page 8-2). 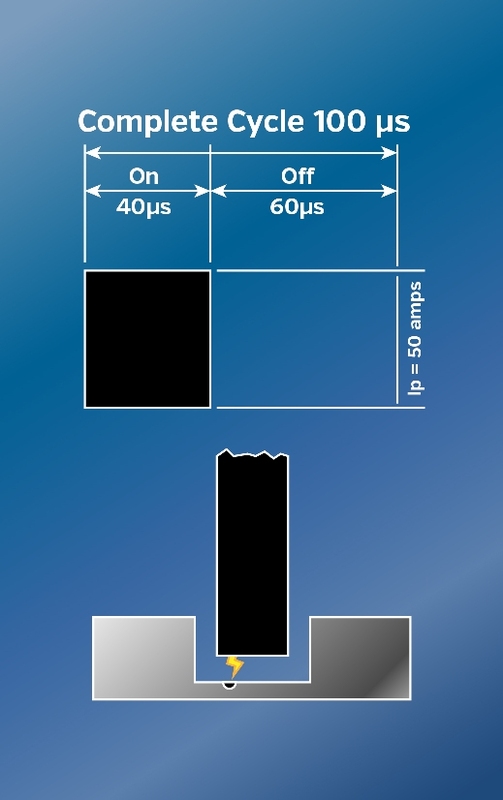 The polarity, on-time, off-time, and peak current (Ip) are the basic machine settings. These parameters can also be expressed as duty cycle, frequency, and average current. Duty cycle is a percentage of the on-time relative to the total cycle time. Generally, the higher duty cycles mean increased cutting efficiency. The duty cycle is calculated by dividing the on-time by the total cycle time (on-time + off-time). The result is multiplied by 100 for the percentage of efficiency or duty cycle. Frequency is the number of cycles produced across the gap in one second. The higher the frequency, the finer the surface finish that can be obtained. As the number of cycles per second increases, the length of the on-time decreases (figure 3-3). Short on-times remove very little metal and create smaller craters. This produces a smoother finish with less thermal damage to the workpiece. Low frequencies are generally used for roughing operations. Longer on-times create craters that are deeper and wider, thus removing more metal. It also allows more heat to sink into the workpiece which means the recast layer will be thicker and the heat affected zone will be deeper. Peak current is the maximum current available for each pulse from the power supply/generator. Average current is the average of the amperage in the spark gap measured over a complete cycle. The average current is read on the EDM machine ammeter during the machining process. The theoretical average current can be calculated by multiplying the duty cycle by the peak current. Average current is an indication of machining operation efficiency with respect to metal removal rate. Figure 3-3. Frequency changes the surface finish of the workmetal. All work (metal removal) is done during on-time. For a given peak current and a fixed on-time, spark energy will remain constant even though the average current may be varied considerably by changing the off-time. Each spark, regardless of off-time variation, will remove the same volume of workpiece material, resulting in the same surface finish value. Variations in metal removal rate (in3/hr) occur because of differences in spark frequencies due to changes in nonproductive time (off-time). Major variations in surface finish occur only when on-time or peak current change. In the following example (figure 3-4) a constant on-time of 50 µs and peak current of 15 amps were maintained. The 50% duty cycle had a 50 µs off-time. The 33% duty cycle resulted in significantly less metal removal because the off-time was doubled. The off-time was cut in half to produce a 67% duty cycle and the metal removal increased. The surface finish at all three duty cycles changed very little because the crater created by the spark did not change. The improvement in electrode wear, expressed as End Wear (EW), at the higher duty cycle should also be noted. Figure 3-4. Effects of duty cycle changes on metal removal rate and surface finish. The higher duty cycles give a faster MMR. Note: Graph does not depict surface finish (SF) as a parameter on the coordinates. The surface finish is given only as a numerical value. 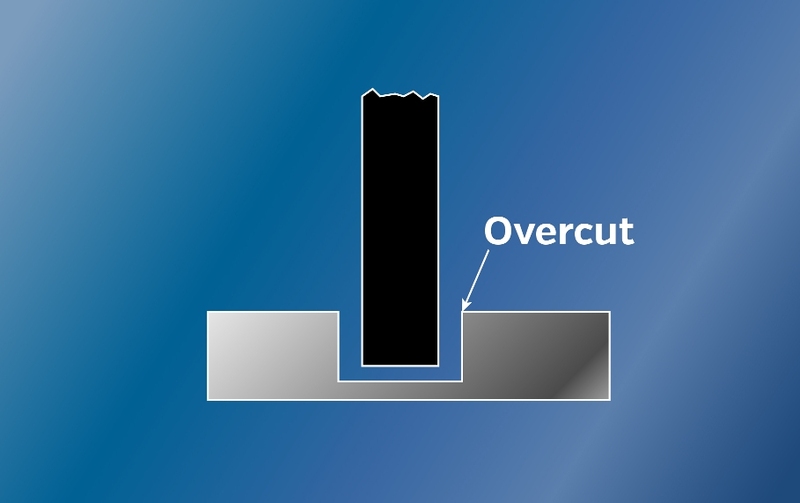 The width of the EDM cavity is always larger than the electrode and the difference is called the overcut or overburn (figure 3-5). 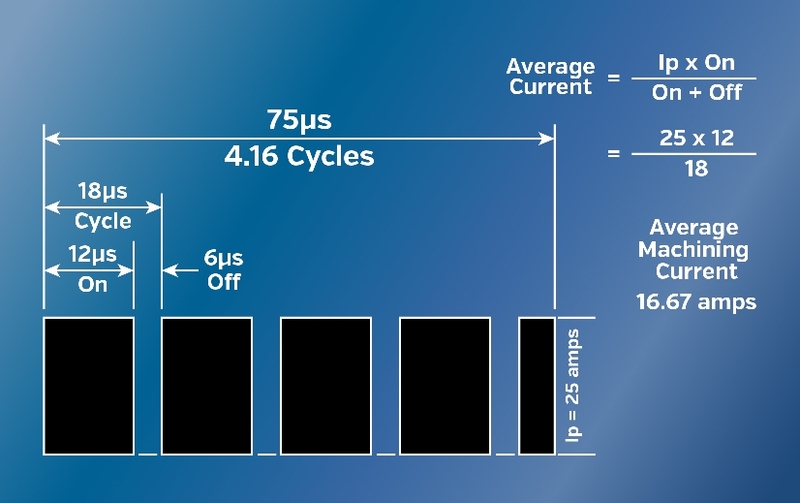 The overcut gets larger as amperage and on-times are increased. These two parameters directly affect the size of the overcut and the roughness of the finish. The amount of overcut has to be known in order to properly undersize the electrode. Most equipment manufacturers supply accurate overcut information. Figure 3-5. There is no direct contact between the workmetal and the electrode. The electrode is always smaller than the width of the final cavity to allow for the spark gap. The EDMer's job is to control the machining parameters and predict the results. Varying the on-time and/or off-time will change the duty cycle and the frequency. These changes plus varying the peak current will affect the metal removal, electrode wear, and finish. The following examples show typical changes and how results are influenced by these changes. All of the examples used positive polarity, tool steel as the workpiece, POCO EDM-3 as the electrode material, and a 5-minute cutting time. The metal removal rate, end wear, and surface finish results are given for each cut. This example is the base cut (figure 3-6). The complete cycle time is 100 microseconds. The on-time is 40 microseconds and the off-time is 60 microseconds. The peak current is 50 amps. From this information the duty cycle and frequency can be calculated. This is what happens — A 40 % duty cycle with a frequency of 10 kHz will result in a specific surface finish and a constant metal removal rate. Figure 3-6. Machining parameters for Example 1 and the effect on the workmetal during one cycle. In this example (figure 3-7), the duty cycle remains constant, but the on-time and off-time have been cut in half. The on-time is now 20 microseconds and the off-time is 30 microseconds. The peak current remains at 50 amps. The duty cycle remains at 40%, but the frequency doubles from the original 10 kHz to 20 kHz. This is what happens — The peak current contained in each discharge is the same, but the length of the on-time has been halved along with a proportional decrease in the volume of workmetal removed during each discharge. 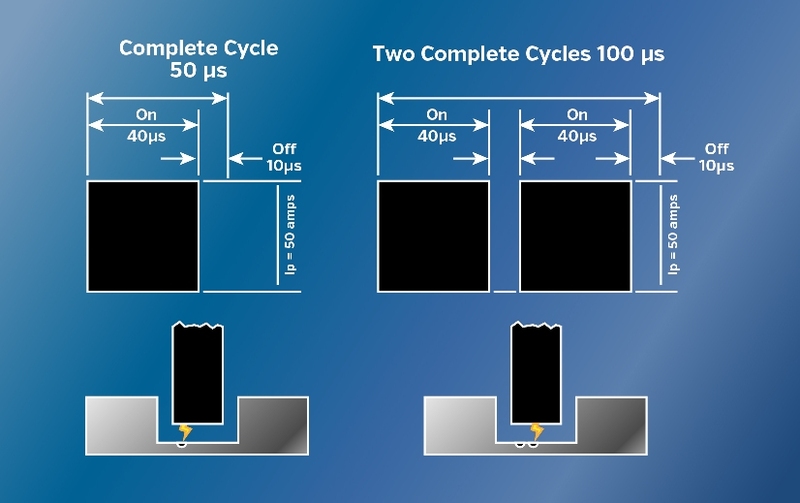 Since two cycles can be completed in the same amount of time (100 µs), the metal removal rate should not change. The amount of metal removed is directly proportional to the amount of energy contained in each discharge. 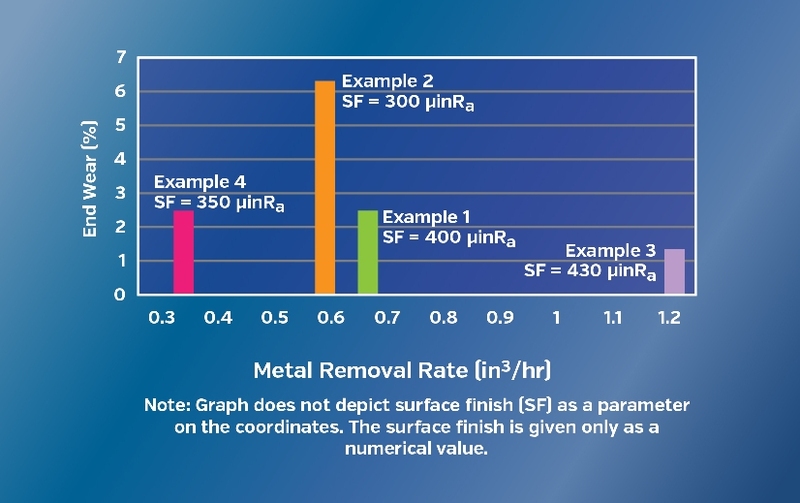 Expected results — Improved surface finish with no significant change in metal removal rate. The metal removal rate remains about the same because, although individual sparks, or discharges, are each removing half the volume of workpiece material, they are doing so at double the frequency. The energy used in any given time period remains the same. Figure 3-7. (Left) Machining parameters for Example 2 and the effect on the workmetal during one cycle and (Right) during two cycles. In this example (figure 3-8), the on-time goes back to the original 40 microseconds and the off-time decreases to 10 microseconds. This increases the duty cycle to 80% and the frequency stays at 20 kHz. In the previous example, varying the frequency improved the finish, but in this example the results are quite different. This is what happens — The amount of energy per discharge and the amount of workpiece material removed per discharge remain unchanged. The big change is that the shortened off-time allows twice as many discharges to occur over the same length of time. Expected results — Relatively unchanged surface finish, but the metal removal rate should double. The key is in the duty cycle; this value must be quoted along with frequency in order to fully define the electrical machining characteristics. For a fixed frequency, spark duration could vary from 1% to 98% of the cycle time giving vastly different results. Figure 3-8. (Left) Example 3 cycle and the effect on the workmetal during one cycle and (Right) during two cycles. Up to now, the manipulation of the on-time and off time has controlled the surface finish and metal removal rate. The constant value throughout these examples has been the peak current. Similar results can be obtained by manipulating the peak current. Using the original parameters of 40 µs on-time and 60 µs off-time, the duty cycle remains 40% and the frequency remains at 10 kHz. 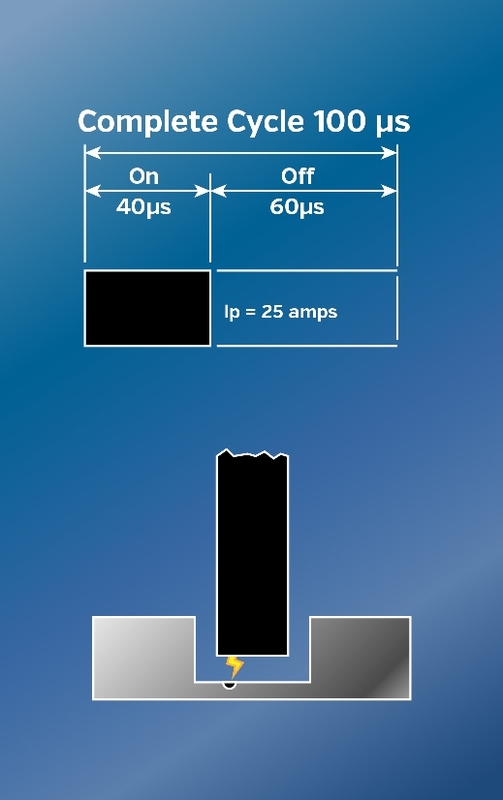 The previous 50 amp peak current will be changed to a 25 amp peak current setting (figure 3-9). This is what happens — Because the peak amps are halved, the energy in each discharge is also cut in half. Expected results — Lower metal removal rate and improved surface finish. Figure 3-9. Machining parameters for Example 4 and the effect on the workmetal during one cycle. Figure 3-10. Four cuts were made using the parameters of the four examples to compare results. 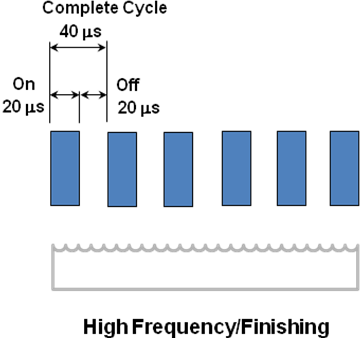 These example cuts (figure 3-10) and the resulting data show the relationship between surface finish, metal removal rate and electrode wear (figure 3-11) that is controlled by the amperage and length of on-time and frequency. Example 1— This is our basic cut. Machine settings are 40 µs on, 60 µs off, and 50 amps peak current. The duty cycle is 40% and the frequency is 10 kHz. Example 2 — This cut shows a frequency change. Machine settings are 20 µs on, 30 µs off, and 50 amps peak current. The duty cycle remains at 40% and the frequency increases to 20 kHz. The result is an improved surface finish with little change in the metal removal rate. The electrode wear has increased due to the reduction of on-time. Example 3 — This cut shows a duty cycle change. Machine settings are 40 µs on, 10 µs off, and 50 amps peak current. The duty cycle increases to 80% and the frequency remains at 20 kHz. The results are an improved metal removal rate, a rougher surface finish and almost a no-wear situation for the electrode. 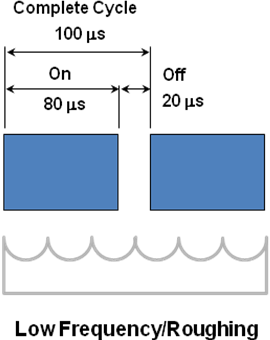 Example 4 — This cut shows a peak current change. 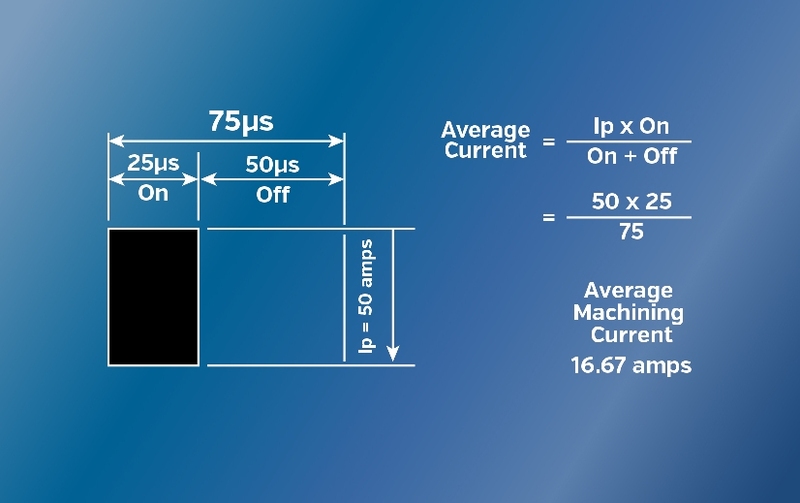 Machine settings are 40 µs on, 60 µs off, and the peak current decreases to 25 amps. The duty cycle remains at 40% and the frequency decreases to 10 kHz. The results are an improved surface finish, a much lower metal removal rate and an increase in the electrode wear. Figure 3-11. Comparison of all example cuts. The following examples (figures 3-12 and 3-13) show different parameters, but both have the same average current value. Both examples have approximately the same metal removal rate, but the example in figure 3-13 would produce a finer finish. Figure 3-12. 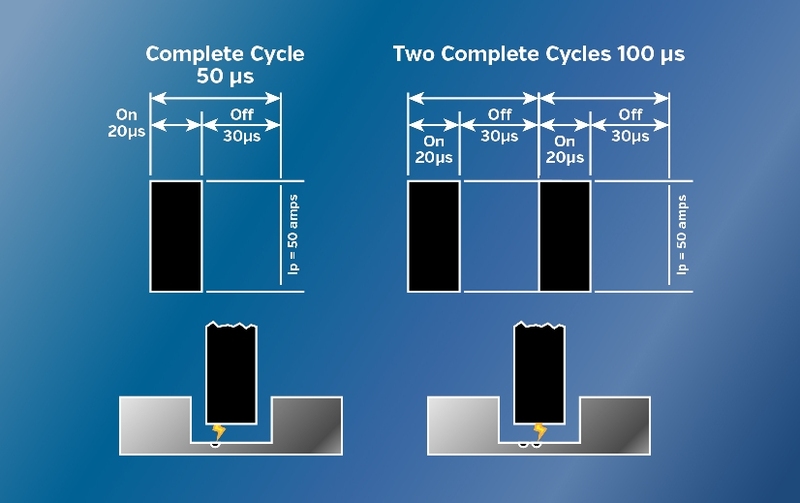 The above example shows how to determine the average machining current. Figure 3-13. This example has the same average machining current, but the surface finish would be better due to the increased number of cycles per 75 µs. Often the desired result can be achieved by more than one means. Deciding which parameters to use is a factor of the type of application, electrode material, size and flushing methods. This is why performance charts can be helpful.